The iPad is a fun and handy device, as everyone knows, but getting real work done on it can be difficult. Even replying coherently to an email message isn’t trivial, because the iPad’s virtual keyboard isn’t a real keyboard. I’m a rapid and handy ten-finger typist, but the iPad turns me into a clumsy one-finger hunter-and-pecker capable only of artificial, short sentence fragments. 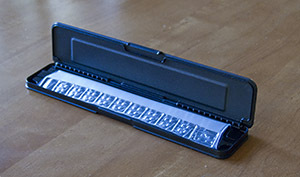 One obvious solution is a Bluetooth keyboard; but that’s just another piece of equipment you have to carry around with you. The TouchFire proposes a different approach. 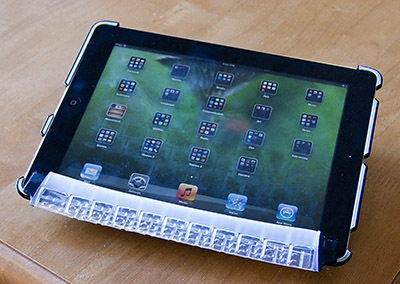 The TouchFire isn’t a keyboard at all; it’s a piece of plastic that lies on top of your iPad, attached by some magnets, just covering the area of the standard virtual keyboard. 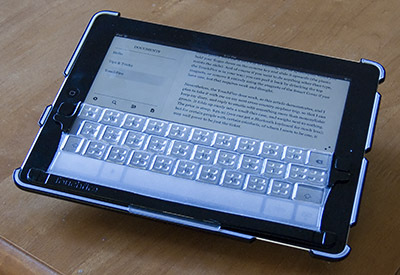 The plastic is thin enough that your touches are felt by the iPad’s touchscreen, but thick enough to give your fingers a sense of position and feedback, as if you were typing on a very thin physical keyboard. The result is that a ten-fingered typist can, with a bit of practice, type at a reasonable pace with all ten fingers, and can thus create text at a reasonably mature level of intelligence. The proof is that the first draft of this article was generated entirely on my iPad with the TouchFire. Undeniably, the TouchFire, while ingenious, is a compromise. It obviously can’t solve the problem of the iPad virtual keyboard being undersized and deficient in comparison to a physical keyboard. It requires practice, as I’ve already said; there is an art to striking the keys hard enough to be felt when you want them to be, while holding your fingers still enough the rest of the time that they are not sensed as unwanted keystrokes. The TouchFire works rather poorly with the iPad’s shortcut for entering, say, an apostrophe, where you hold your finger down on the comma key and slide it upwards (the plastic resists the slide). And of course if you want to do anything other than type, the TouchFire is in your way; you can peel it back by detaching the top magnets, or remove it entirely using the magnets of the Smart Cover if you have one, but that requires work and thought. Nevertheless, the TouchFire does work, as this article demonstrates, and I plan to take it with me on my next cross-country airplane trip, so that I can keep my diary, and reply to emails with something more than monosyllabic grunts. It folds up nicely into a small case, and weighs next to nothing. The price is steep, $49.95 (you can get a full Bluetooth keyboard for less); but for certain people with certain mindsets, of whom I seem to be one, it may well prove to be just the spark you need. How easy would this thing be to sterilize? I know more and more medical people looking for ways to control resistant bacteria and viruses. “… a critical reality: antibiotic resistance already exists, widely disseminated in nature, to drugs we have not yet invented.